Long time readers know that I occasionally point out events I feel have particular merit. 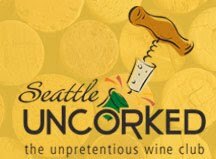 Seattle Uncorked's 9th Annual Syrah tasting, which takes place Wednesday April 21st, is such an occasion. Outside of Taste Washington, this is one of the Seattle-area events I look forward to most each year. It is rare to have the opportunity to sample dozens of Syrah side-by-side. However, to be able to focus on the wines from one particular region, in this case Washington State, is a unique opportunity. Washington Syrah has garnered a great deal of critical attention. While consumer response remains somewhat mixed despite offering good value compared to their counterparts from other regions, the grape continues to excel here. Seattle Uncorked's David LeClaire likes to pair his events with good causes. This event is a benefit for FareStart, a job training and placement program for homeless and disadvantaged individuals. The event features wines from over forty-five Washington wineries (see list below) along with food from West Seattle's Salty’s. This event sells out every year (it is close to sold out already), so if you are interested make haste! Tickets are $45 and can be purchased here (Note: The procedure for purchasing tickets is a bit mind-numbing but FareStart is a non-profit organization, and I did mention it was for charity right?). Read a post about last year's event here.